There are many video works created by various independent artists these days, many of which seem to have no storylines and contents hard to comprehend. But the potential of this media is limitless and there are many fresh imageries being created continuously. Unfortunately, we do not have enough occasions in which we can come in contact with borderless variations of the genre. It is for this reason we assemble this VIDEO PARTY, where we can screen and make records of these ever-growing works of independent artists, as well as to simply increase the opportunity for Indies video works to be seen. 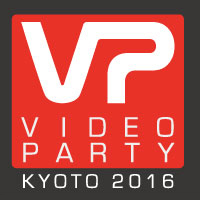 Based in Kyoto, the VIDEO PARTY has been organized for independent artists to exhibit their works, regardless of their nationality, affiliation, standpoint and genre - ranging from drama, animation, experimental and documentary - and has been screening publicly offered works, since 2013. For this year, the PARTY will be held in July (provisional), at the “Lumen Gallery”, a video-specialized gallery established in Kyoto last year. We have also started the work exchange program since 2014, in cooperation with several overseas film festivals, educational establishments and Indies film screening organizations. In 2015, we had successful screenings in Taiwan, South Korea and Macau, to introduce participating works of the VIDEO PARTY. We plan to expand the interaction and create more opportunities to screen in more locations this year. We anticipate your joining to this opportunity of witnessing the future and exploring the potentials of video works, woven by various independent artists. Hence, we would like to invite everybody to subscribe your works. Please confirm video works from here. update :: 07/01/2016 / Copyright(C) 2016 PERSONAL EYES All Rights Reserved.